Diary submitted by Gianina D.
Pronunciation accuracy is difficult for ESL learners in Spain and sometimes this can cause significant problems in communicating their ideas and general conversation. When I am teaching pronunciation, my usual approach is to ask my students to repeat the mispronounced word after me until they are confident in saying it correctly. I say the word slowly and clearly so that the student can hear me, I make eye contact and over-exaggerate the shapes I make with my mouth so that they can copy me, and I try my best to convey patience rather than being patronising. When a student is repeatedly thrown off by a complicated, multi-syllabic word in a text, we laugh about it and I help them through it. I find that not taking their pronunciation mistakes too seriously helps create a comfortable environment where my students can see me as a tutor who wants them to excel, rather than an intimidating teacher who nitpicks their every flaw. Furthermore, it’s hard to know when to interrupt and how often to do so if pronunciation errors occur but the head teacher at my language academy has fed back to me that I use a good balance of error correction and appraisal. This is important especially when teaching students with less confidence so that they don’t feel too self-conscious. One specific pronunciation error that occurs frequently is not knowing how to pronounce the vowel ‘I’ in a word, as there is no set rule to help me explain when to use ‘I’ as a short or long vowel sound. One way to combat this would be to do an exercise called ‘Odd One Out’, which I found on a blog post by Ruth Wickham. The exercise involves putting “similar words into groups of three – two with one sounds, and one with a different (although similar) sound”, for example: ‘meet’, ‘seat’ and ‘sit’ (to practise vowel sounds). The student either reads or listens to the words and has to identify the odd one out. I like the sounds of this game because it would be appropriate for ESL learners of all ages and abilities, and could be done as a reading or listening exercise. 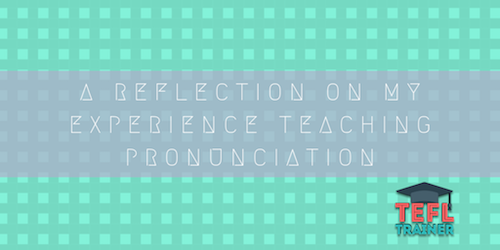 Another piece of advice to heed from Joseph Hudson’s article on teaching pronunciation is that it’s better not to isolate words, as the student will better understand how to pronounce the word (especially the first and last phoneme) when it is connected to other words. My students generally don’t know the international phonetic alphabet, so if I feel it would benefit the student to write a word down to help them with their pronunciation, I write down the word phonetically, but in a way with which native English speakers would be able to relate. I have come to realise that when students write down words phonetically in their personal notebooks to help them remember, they use a completely different system of phonetic notation. I have noticed that Spanish people write down English words according to Spanish phonology. For example, they would transcribe a word beginning with /θ/ as /z/, whereas I would transcribe it as /th/. This conflict has made me realise that in English we have sounds that do not exist in other languages and it’s hard for EFL learners to get to grips with learning new phonetics. I therefore cannot expect them to find it easy to mimic my pronunciation when we each have our own language and regional dialect, too. In conclusion, I have learned that all EFL students have their own phonological notation strategies, and even though it’s easy enough to get students to perfect their pronunciation through repetition, it’s a challenge to explain why certain words are pronounced one way if there is no set rule. However, there are games and exercises such as ‘Odd One Out’ that could help me improve my method of teaching pronunciation in EFL.